In a mixing bowl, cream the shortening and peanut butter. Add the brown sugar, eggs, and vanilla; mix well. Combine oats, flour, baking soda, and salt; add to the creamed mixture and mix well. Drop by the rounded teaspoonfuls onto ungreased baking sheet. Flatten with fork. Bake for 12 minutes or until done. My family loved these cookies. I use butter in cookies instead of shortening and also added raisins. I have a request to always have these baked and handy! 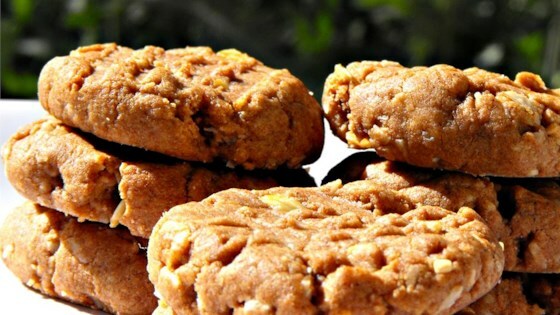 Fairly healthy and tasty cookies. Not too sweet. Makes large batch and the cookies freeze well. Good with milk or coffee. Could be more peanutbuttery. I'm 12 years old and this recipe was delicious and was easy to make! I loved it and so did my family. Thank you so much! These were delicious. I did use canola oil instead of shortening. But, the peanut butter flavor did overpower the oatmeal flavor a tad, so next time I will use half as much peanut butter.